A whole new AQ Worlds begins! The Queen of Monsters obliterates an entire continent to build her fortress. Rally your friends & BATTLE ON! Read more here. 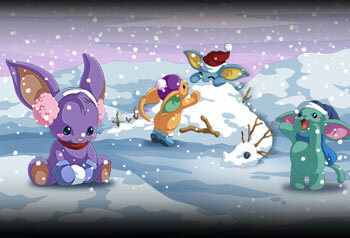 Jingle bells, Quibble sells rare items in the game; 12/19 & 12/30 there’ll be new items for you to claim! 12/23 begins Limited Quantity Shop, too! Log in each day for a new FREE gift when you talk to Tinsel in Battleon! Earn double Gold, XP, Rep, and CP boosts over the holiday weekends. More info can be found here. Play our New Mobile Game, AQ: DRAGONS! How do you train your dragon? Raise 12 dragons in our new free game. 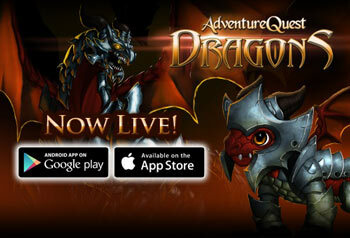 AQ: DRAGONS is available on Google Play and iOS; coming soon to web! GET IT HERE, DRAGON MASTER! New Holiday Art Contest: Enter Today! Happy Holidays and Seasons Beatings! A new holiday contest has begun and we want YOU to create AQW-themed art. Click here for full details. Bundle up and Battle ON! Rumor has it that a treasure trove of unfathomable riches awaits brave heroes, but no one has ever returned... Can YOU claim ALL the glory? AQW’s first ever Adventure Pack, Bonebreak Berserker, receives its highly anticipated full update: new map, new battles, Armor sets, & much more! Listen up Rare Item Hunters! 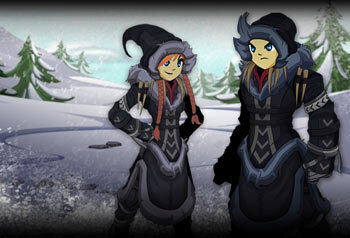 The rare Tundra Stalker arrives this Friday in the Limited Time Shop. Claim these Rare Items until Thurs. 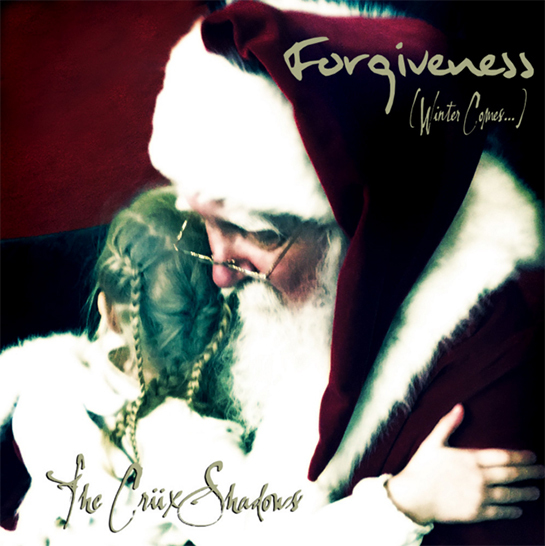 Dec. 18! The 13 Lords of Chaos were ONLY the beginning! When the WorldBreaker rises, the fabled Ancients will return to power & forever change the world! and the entire AQWorlds Team. Frostval is finally here friends! ...and you know what that means? Presents! New adventures! DOOOOOM? An infamous super villain has just returned to destroy the spirit of Frostval. Will you draw your weapon and open your spellbook to save this magical season? (What if we told you that your presents were at stake?) To make this adventure unique, you must choose whether to be naughty…. or nice… on your quests. Different “Good” and “Evil” options will present themselves as you help save Frostval from a very, very, very naughty not-so-little boy. Showing the spirit of Frostval.... literally! 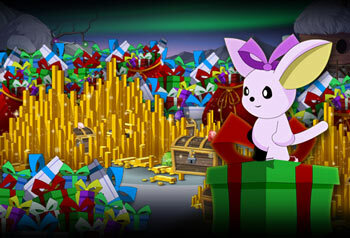 Everyone’s favorite traveling sales moglin is in Battleon—and he’s staying put until the new year! 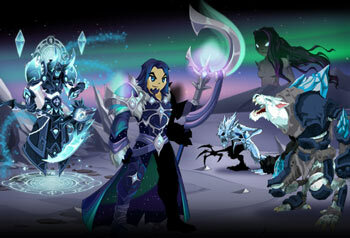 He’s got 3 new RARE lunar eclipse-themed weapons in addition to his 27 Frostval goodies. 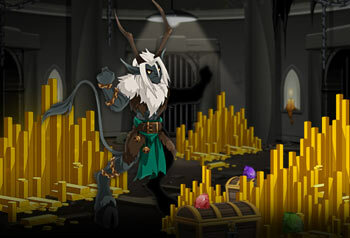 No one knows if Quibble’s items will ever return, so make sure you get his gifts while you can! Holly Knight? ... where is the Silent Knight? It looks like Santy Claws came early this year! Members: get your 5 wrapped presents from the giant red bag in Battleon! These presents will magically open at the start of the new year… including a CLASS. That’s right—not an armor, but an actual Class! 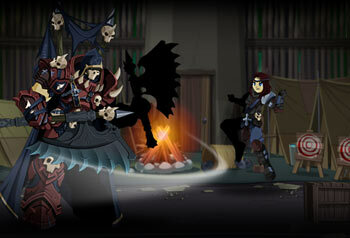 The Frostval seasonal shop has also made its way to town, loaded with 2010 Frostval Seasonal Rares! Make sure to talk to that little adorable purple Moglin in Battleon too. That’s Tinsel and she has 2 quests you can go on to get 3 additional presents! These too will open at the start of the new year. 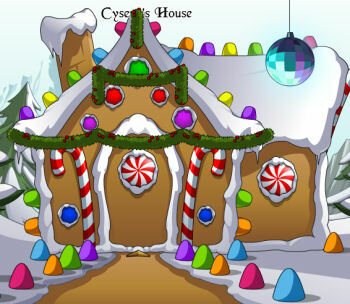 Get your very own seasonal rare Gingerbread house in Blizzy's House Shop after you have saved Frostval! He…she… well I don’t exactly know what gender Blizzy is… but Blizzy also has a few festive house items to decorate your humble abode with. Don’t forget that there are seven new houses in the Centaur 21 Realty shop, too. Visit Penny the Centaur by joining the buyhouse map. Here is your chance to upgrade your current home to the Skyguard Cruiser, the Volcanic Cave, the Cloister Tree House, and more! Yum! This has been our tastiest contest yet! The winners to the 2nd Annual Creative Dessert Contest have been announced. With so many delectable entries, it was too hard to pick just one winner… so instead we picked A BUNCH. Congratulations and thanks to everyone who participated! Remember guys and gals, this was a contest. We had over 300 entries to go through and we really wish we could have made everyone a winner. But it is a contest afterall! But... you know what? You still won something: you got to eat your own delish creation =D And we look forward to seeing your participation in future contests! There is only one way to win--and that's to keep on tryin'! If you are a Member of AQworlds, you can partipate in the Alpha of our new MMO, HeroSmash! While still in testing, the guys working on the new game added new Holiday themed hero-items (rare?) that you should grab while you still can. Happy Frostval and a Epic New Year!